Enjoy boating, swimming and fishing on beautiful Lake Diefenbaker . Located a few kilometres from the Village of Riverhurst, this lake is the largest body of water in Southern Saskatchewan. Lounge on sandy beaches, picnic at a secluded cove, or hike to the top of a coulee and enjoy the vistas. World class fishing awaits! World record rainbow trout and world-record burbot have been caught in Lake Diefenbaker. Every Father's Day weekend, Riverhurst hosts The Riverhurst Walleye Classic , a 2-day catch and release tournament with up to $23,000 in prizes. Located on the shore of Lake Diefenbaker, a short, 12-minute drive from Riverhurst, Palliser Regional Park is home to Sage View Golf Club , public beaches, heated swimming pool with seasonal aquatic program, dining at the Mainstay Inn , and a kitchen camp hosting a Farmer's Market and Pancake Breakfasts . Admission fees are by donation. Contact the Museum at 306-353-2112 or Judy Miller at 306-353-0014. The Riverhurst Library is located in The Village Square. The library is utilzed year round by the residents of The Village. The interlibrary loan program in Saskatchewan is what makes our library system one of the best in the country. Simply use your library card from any branch in the province. You can borrow books from one branch and return them at a different location! The Library is open Tuesdays from 11 am to 5 pm and Thursdays from 9:30 am to 3pm. Reading is awesome! The Riverhurst Ferry runs 24 hours a day throughout the summer months. 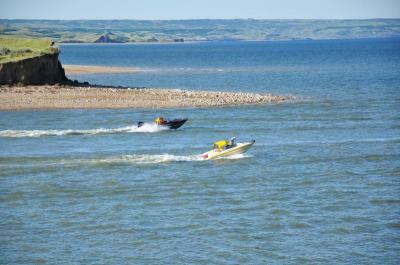 Take a ride; its free, fun and a fast way to get across beautiful Lake Diefenbaker. The Sageview Golf course boasts 9 holes and some exceptional elevation changes. Lets hit the links! Beautiful beaches are just minutes from your doorstep! Lake Diefenbaker has over 800 kilometres of shoreline, enjoy a day on the water.